UHV Transfer loadlocks and transfer systems can be customized or modified to fit many requirements where a standard loadlock cannot be used. For non-standard process chambers with an interface other than a SEMI-compatible interface, modifications can be made to the loadlock mounting flange or adapters can be provided. Examples of other variations include adding accessory ports for surface topography measurements within the loadlock chamber or for pre-treatment. A wide variety of chambers with unique sizes and shapes have been provided as well as dual-directional chambers with more than one transfer arm so a substrate can be introduced into one chamber and then into another without removing it from the loadlock. A few customized systems are shown below. 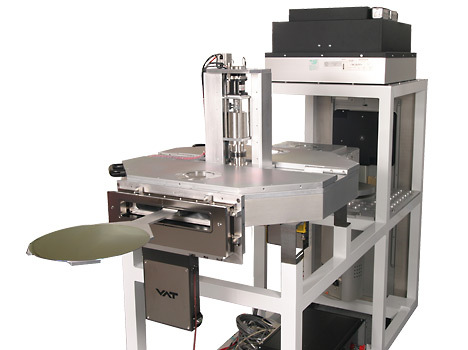 An OEM manufacturer wanted to offer their customers a cost-effective transfer system as an alternative to a robot for low volume sample introduction. Manufacturer required a loadlock and introduction system to insert a graphite sample platter 13 inches in diameter holding 21 two-inch GaAs wafers into a MOCVD Tool. 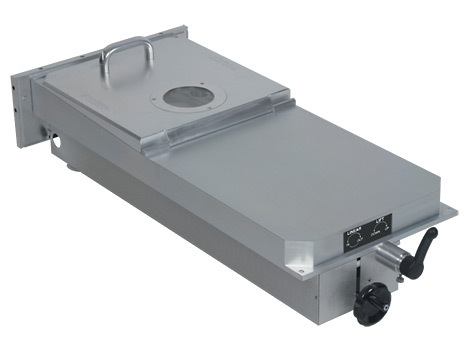 The process chamber does not have vertical lift to remove the platter and high precision placement is required. A manually operated 320mm TEAM-Mate Loadlock System with vertical lift/lower capability was provided. The rotation of a simple hand crank extends the transfer arm carrying the platter. The turn of a lever lowers the platter and sets it onto the receiving stage. Limit switches on the linear travel restrict the gatevalve from closing on the transfer arm before it is retracted and the system includes pneumatic door locks to assure a secure closure. A builder of 200 and 300mm ALD (Atomic Layer Deposition) systems desired a low-cost method of inserting wafers into one chamber for processing and then into a second process chamber without exposing the wafer to air. A transfer mechanism that can accept a 300mm wafer and load and unload it into a high temperature (1100C) process chamber under vacuum. The system must have preload and post cool-down areas in the vacuum chamber to allow for higher throughput. A four-station Carousel chamber with two magnetically coupled slides and a isolated wafer load lock was provided. One of the linear slides could retrieve the wafer from the loadlock and place it on one of the four rotating carousel stations. The carousel could then lift the wafer off the paddle and rotate to the next station allowing additional wafers to be loaded. When the wafer was rotated to the front of the process chamber, the carousel would place the wafer on the second magnetically coupled linear slide that would load and unload the wafer into the process chamber. The unloaded wafer was allowed to cool in the final position before returning to the loadlock paddle station. This process allowed for a continuous flow of wafers through the tool with minimal impact on throughput. The simple motions of the linear slides and rotating carousel also simplified the alignment process and reduced maintenance time for a lower cost then a standard vacuum robot system. A custom loadlock and transfer was required for sample introduction on a three-source co-sputtering system designed and manufactured by Angstrom Engineering. 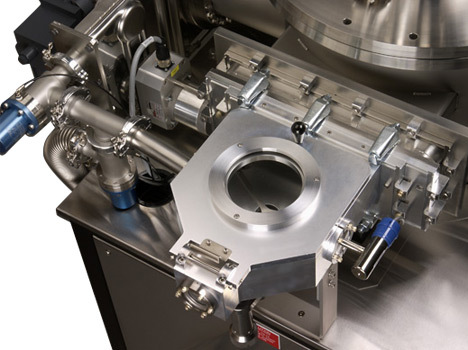 This system deposits metals and ceramics for materials research and is one of many custom vacuum systems provided by Angstrom. Angstrom Engineering incorporated a customized MASCOT Loadlock System into this sputtering system. 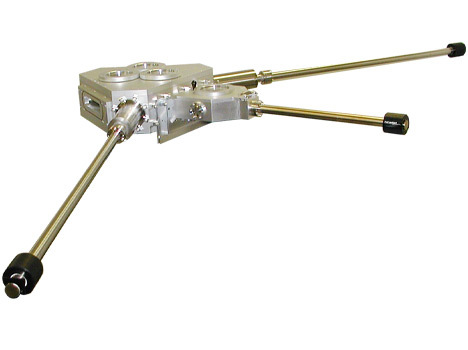 With the Precision Magnetic Manipulator (PMM) installed on one side of the process chamber and the MASCOT on the opposite side, the PMM remains under vacuum. The PMM can be extended to lift a wafer from within the loadlock and then retracted to place it into the chamber for sputter deposition processing. This unique set-up of the MASCOT and PMM allowed Angstrom to reduce the overall footprint size of this system.